The tomb of the Beard family is situated to the south of the church. 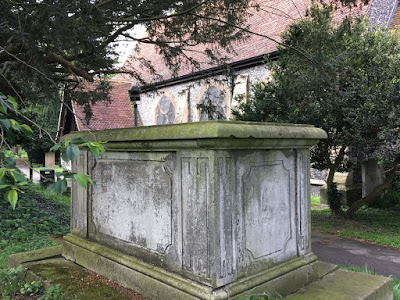 The date of the tomb is 1819, when Thomas Beard died and was buried. His wife Elizabeth died two years later, and from a record made of the inscription in 1972 it appears that their daughter Mariane, born at the time of her father's death, died in 1827. There are no entries for the family in the register of burials. The tomb is a chest tomb of simple form, on a stone base. The corner pilasters are emphasised by geometric neoclassical Greek borders, the inscriptions between being contained within incised panels. On the north face: 'underneath lie the remains of Thomas Beard citizen & merchant of London / who died Sep 6 1819 aged 79 years also Elizabeth wife of the above who died Sep 13th 1821 aged 40 years'. On the south face: 'in memory of Anne wife of James beard of Manchester who died Sep 30 1877 aged 60 years'. The lower part of this inscription, believed to commemorate Mariane Beard, is no longer legible. The tomb although interesting is not a listed monument.